The original Dumbo cartoon was created in 1941 and was 64-minutes long. It took place in a circus and concerned a baby elephant with large ears who was criticized by the other animals and attendees. His Mother, Jumbo, still loves him anyway and they are separated early on after she destroys a circus tent while protecting him. His best pal is a talking mouse in a ring leader outfit who helps inspire him to use his ears to fly. And fly he does, specifically when he is holding a feather with his trunk. Once the animals and people see what an incredible creature the young elephant is, they treat him with the respect he deserves. There are a few songs, some questionable racism (the jive talking crows specifically have not aged particularly well), and some truly spectacular animation given the year it was made — but there’s not much to it and the whole thing feels rather episodic. Flash forward nearly 80 years to Burton’s new film. 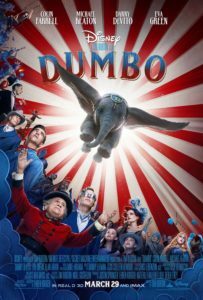 It clocks in at 112-minutes and follows a similar template, replaces the talking animals with humans and expands out what happens to Dumbo once people start taking notice of his extraordinary ability. The crows are gone, as are most of the songs save for “Baby Mine”. The mouse is still there, in his full costume, but he spends the entire film in a cage acting like mice do. Dumbo’s inspiration here comes from precocious children Milly and Joe Farrier (newcomers Nico Parker and Finley Hobbins) who train him to fly whenever he swallows a feather for some odd reason. 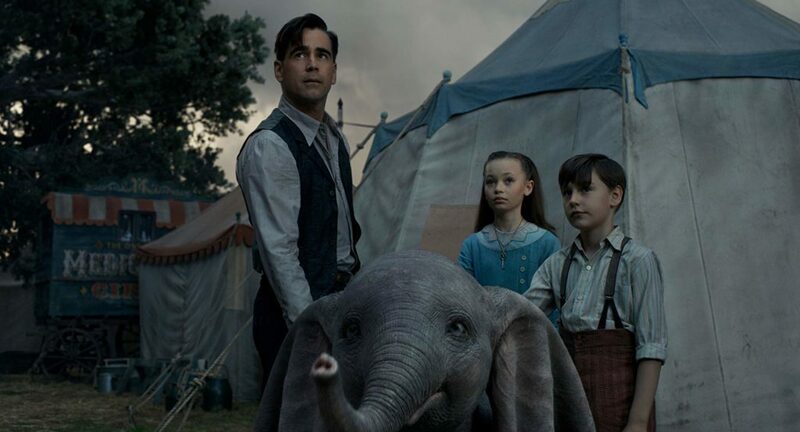 There’s more to the film of course, including subplots involving the children’s disabled father Holt (Colin Farrell) who lost his arm in the war and is now in charge of wrangling and caring for Dumbo, ring leader Max Medici (Danny DeVito) whose ailing circus is single-handedly saved by the talented young elephant, amusement park owner V. A. Vandevere (Michael Keaton) who buys Medici’s circus without the best of intentions, and his trapeze artist wife Colette Marchant (Eva Green) who gets paired off with Dumbo for a new act. And then there are the other circus performers and an underlying theme of animal activism. I mention all of these things in hopes that it illustrates the root problem at the heart of Burton’s take on Dumbo: there’s too many characters and too much going on. The animated film was simplistic and this live action film blows up that simplicity in favour of something far more complicated. It has its heart in the right place with the animal activism push (even if it feels less realistic than Dumbo’s ability to fly given the time period), but there’s way too much junk that gets in the way of the core story. Whenever the film shifts its focus away from the title character, it becomes downright chaotic because it has no idea who or what to focus on instead. This is made even worse by the pacing. After all the pieces are set in motion and the kids discover Dumbo can fly, the film sets up a training montage that never happens. It just inexplicably cuts to weeks later where Dumbo is already a seasoned flying vet and is finally performing in front of a crowd for the first time. And just as quick as he becomes the star the ailing circus needs, Vandevere shows up, buys the circus and sends the film racing to its inevitable ending. There’s no time to dwell on anything happening, no time for any of the characters to react and even less time for anyone to properly develop. It all just feels thrown together and rushed — as if Burton and his team realized they had too many characters much too late and the only way to save the film was to make it as concise as possible. In fact, the only time the film seems to slow down is when it throws in a specific reference or allusion to the original film. And while some of these moments are organic, others are completely disingenuous and are just there because they have to be. But then again, how does one truly make hallucinogenic dancing pink elephants make any semblance of thematic sense? I understand that I am asking for nuance and depth from a film made primarily for children and families. But if Disney intends to continue the trend of remaking their classic animated films into live action spectacles for a whole new generation (there’s already two more remakes planned for release this year alone, as well as a sequel to a remake), there needs to be a reason and a purpose for retelling the story. Animal activism is a great reason and a great message to instill into developing young minds, but it barely registers as a focal point in the film. There’s just too much noise to be able to truly take notice. What does work well is the look of the film. Every single frame is stunning to view, packed with meticulous details and breathtaking colours. I thought Burton was an odd choice for such a bright film, but his fascination with the circus and its freaks gives the film a heightened sense of reality and authenticity. He has always been a brilliant visual designer, and his work here is just as terrific as you would imagine. Where his content continues to prove quite erratic with each new film, his visuals only continue to improve. And yes, he even gets a few chances to inject some truly macabre elements — including a rather ghastly death scene within the first 30 minutes of the film. The CGI that brings Dumbo and the other animal characters to life is also quite stellar. I was particularly awestruck by the wrinkled elephant skin on Dumbo and his mother, and just how realistic it looks when it moves or interacts with what’s happening on-screen (although it is unclear if the character was a full CGI creation or was performed in motion capture by Johnny Depp). The only time I found the CGI not to be on point was whenever the human characters interacted with Dumbo and were not in a close-up. Whenever human characters were interacting with him in wider shots — or more specifically, riding him — the CGI just looks horribly fake. This may be a result of the 3D conversion (I saw the film in 2D and it was clear which elements would be popping out), but it was odd to see when it looked so fantastic otherwise. As for the acting, Parker and Hobbins are the clear standouts of the film. Their wide-eyed innocence and genuine emotions are pitch perfect. Green is also quite good, using her flawless French accent to great effect and making the most of her one-dimensional character at all times. Farrell does what he can, but his character is not fully defined and his “attempt” at a Southern accent is downright distracting. While it’s fun to see Keaton and DeVito share the screen again (in a Tim Burton film no less! ), neither is given nearly enough to do and the film could have benefited from merging their characters’ arcs into one single streamlined character. And though I will never tire of seeing Keaton flexing on screen, his accent here is ridiculously inconsistent. I would have made a bigger deal of it, but it’s practically negligible in comparison to Farrell’s. When Dumbo is at its best and focused on the titular character, it practically soars. But those moments come few and far between a film jam packed with too many characters, too many subplots and an underlying message that gets pushed aside much too often. And while Burton and his team have crafted a truly beautiful looking film, it does not make up for how hollow and misguided it is on the whole. Here’s hoping Aladdin and The Lion King fare a little bit better.